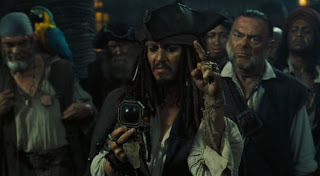 Snippets of Jack: "A Bit More Shiny"
Jack Sparrow returns in The Pirates of the Caribbean: Dead Man's Chest, but although he's captain of the Black Pearl once again, he prefers to ride around in a dead man's chest. Jack's on a secret mission to sneak into this super creepy place where people are fed to birds. But it's all worth it in the end because well, they got a key. Oh wait, no, they just got a drawing of a key... Which is much more better. But of course, sneaking into a fort like that isn't easy. And it's even harder to get out. But Jack, of course, finds a way to anyways. Hence, the rowing in a coffin with a dead man, and what better paddle than a dead man's foot. Ya know, the usual? Jack: "Sorry, mate. Mind if we make a little side trip? I didn't think so." Jack makes it back to the Pearl and his good old crew, who of course, aren't all that pleased with their latest booty. Gibbs, as he sees the dead foot: "Not quite according plan." Jack: "Complications arose, ensued, were overcome." Gibbs: "You got what you went in for?" Jack: "Mm-hmm." Jack then shows off his super handy dandy "drawing" of a key. Gibbs: "Captain, I think the crew, meaning me as well, were expecting something a bit more. . . shiny. What with the Isla de Muerta going pear-shaped, reclaimed by the sea with the treasure. Crew member: "And the Royal Navy Chasing us around the Atlantic." Marty: "And the hurricane." Members: "Aye." Gibbs: "All in all, it seems some time since we did a speck of honest pirating." Jack: "Shiny?" Gibbs: "Aye, shiny." Jack: "Is that how you're all feeling? That perhaps dear old Jack is not serving your best interests as captain?" Awkward silence. . . until Cotton's parrot squawks: "Walk the plank." Ah man, dude, that hurts. Deep. Jack: "What did the bird say?" And of course, he has to haul out his sword, I mean gun, (I just love these quotes). Crew member: "Do not blame the bird. Show us what is on that piece of cloth there." Well, if you're going to be all bossy, why don't you just tell us how you really feel. Then Jack pops up; Jack the monkey, that is. For some reason he's still immortal and all boney. So when Captain Jack shoots at it, nothing happens. Gibbs: "You know that don't do no good." Jack: "It does me." Now, back to the key. Marty: "It's a key." Jack: "No! Much more better. It's a drawing of a key!" Oh goody goody gumdrops guys, we have a picture of a key! After a great chitchat about the drawing, that makes creepy music play, Jack convinces his crew to set out in search of that key. Marty: "So... do we have a heading?" Jack: "Ah! A heading! Set sail in a . . . uh . . . general . . . That way direction!" Gibbs: "Captain?" Jack: "Come on, snap to and make sail. You know how this works. Go on. Oi, oi!" Don't you just love the language of Jack? Marty: "Have you noticed lately the captain seems to be acting a bit strange . . . er?" Gibbs: "Setting sail without knowing his own heading. Something's got Jack vexed, and mark my words, what bodes ill for Jack Sparrow bodes ill for as all." Sorta like the cannibals, the giant sea monster, Squid Face, Cutler Beckett, James Norrington, and that blacksmith William Turner.